Flyer for Affinity for Love week sent by email to CMC students. ASCMC officially kicked off the first ever “Affinity for Love” Week on Sunday. 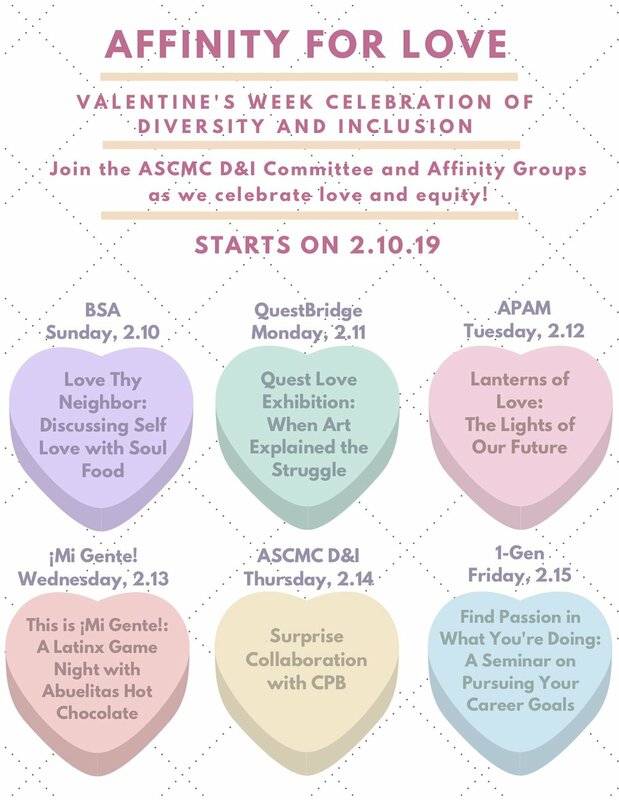 Affinity clubs on campus collaborated to create a week celebrating love and inclusivity, including Black Students Association, QuestBridge, Asian Pacific American Mentoring Program, ¡Mi Gente! and 1 Gen. Salomé Lefort ‘21, ASCMC Diversity Inclusion Chair, spearheaded the effort with unused funds from a Kravis Lab retreat last semester for affinity groups. Lefort said she had been wanting to create an event that involved all the Affinity Groups, and this was the perfect opportunity. Each day an affinity group hosts an event. The week culminates with the the Love Day Soiree on Thursday night and a Carnival on Friday, which all the Affinity Groups worked on together. “All of the affinity groups have done really amazing work, really put in the time and effort for this event,” Lefort said. Check back with The Forum at the end of the week for pictures of Affinity for Love!